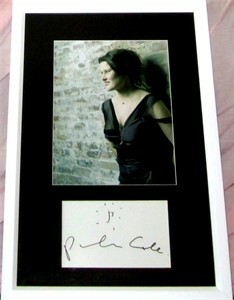 Black marker autograph of Grammy Award winning singer-songwriter Paula Cole (Where Have All the Cowboys Gone? and I Don't Want to Wait are her two hit singles) professionally matted and framed with an 8x10 portrait photo, ready to hang. Obtained in person. With certificate of authenticity from AutographsForSale.com. ONLY ONE AVAILABLE FOR SALE.